The ever stunning Kamru Fort stands at an altitude of 2600 meters above sea level and is only 2 km from the beautiful Sangla Valley. The fort is set at a picturesque location and offers tourists beautiful views of the Sangla valley, streams, apple gardens and many more. The entry to the fort is through a series of gates and at the main gate, a stunning image of Lord Buddha is kept to greet the guests. The Kamru Fort is a popular tourist attraction in the region, which is visited by a large number of tourists every day. Highlights The Kamru Fort has a graceful wooden balcony and at the top of the building is an idol of Kamakhya Devi (Kamakshi Devi), which is worth seeing. The idol is believed to have been brought from Guwahati and is of great importance for the people of Sangla village. There is also a Badrinath Temple in the Kamru Fort, which dates back to the 15th century and serves as the venue of a fair, held once every three years in the honor of the deity. In the procession that takes place at the time of fair, the idol of the deity is taken to Gangotri, the origin of the River Ganges. This stunning fort is enveloped by snow capped mountains, dense forests, and lush green fields and is adorned with beautiful wooden carvings. Kamru is shaped like a tower and is made up of five storeys that rest on a 55 square feet stone platform. 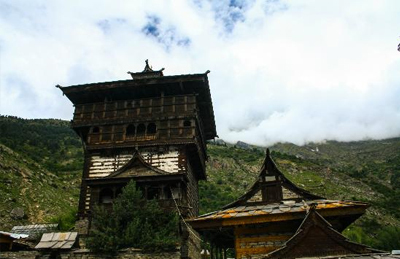 The architecture of Kamru Fort is remarkable making it one of the must visit destinations in Sangla, Himachal Pradesh. 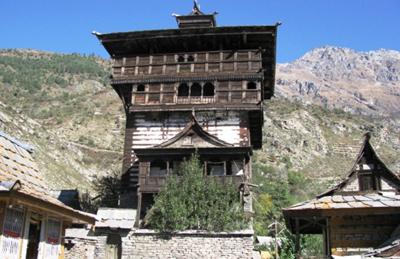 Other Facts	The Kamru Fort contains an elegant timber terrace, which is marvelously decorated by timber carvings. 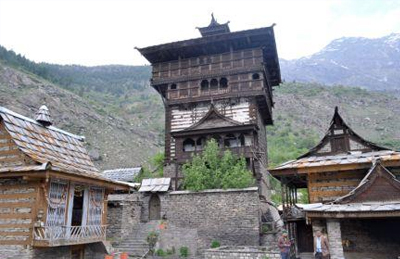 Its structural design is noteworthy and should definitely be seen during your trip to Sangla, which is well-connected through road to other major cities of Himachal Pradesh.